Bar Mitts will keep your hands warm when the temperature drops. 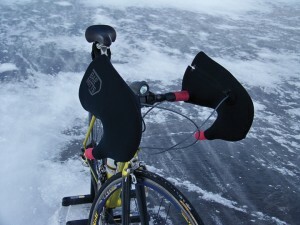 The winter of 2010-2011 gave me time to evaluate a few products that may be of use to commuters. Most dedicated winter bike commuters have their favorite products, so I would like to hear any comments about products in response to this article. Visibility: I’m not going to rant again about lack of or inadequacy of lights among many of the cyclists that I see, but I am going to comment on the use of vests with reflective material and illuminated vests. I’ve been impressed by the “illumination” of cyclists from the reflection of my headlight off of their vests enough to start wearing one as an adjunct to my light system. This was very apparent one night when I spotted a rider wearing a reflective vest much sooner than his solitary blinking light (though obviously running on a nearly dead battery). But don’t take my word for this. Bob Mionske had a good article in Bicycling Magazine on reflective clothing. In summary the article stated that reflective material has a perception distance (how far something is first spotted but not recognized) of 1200 to 2200 feet at night with actual recognition distance (distance a driver will recognize what is being seen) of a cyclist from 260-700 feet (vs. 75 feet with dark clothing) with motion of the reflective material aiding recognition. Additionally, fluorescent clothing increases a driver’s perception distance in the daytime from 400 ft. to 2200 ft. and at night from 150 feet to 560 ft.
Reflective vests can be purchased for as little as $10 for a cheap added means of being visible. The only downside is the loss of many “style” points. I did purchase my wife an illuminated vest that has multiple flashing LED’s. These go for $30-40. The LED’s are definitely eye-catching, but not enough to replace blinking lights on one’s bike in my opinion. Change is difficult, so I may need more evaluation before I can endorse these as a solo unit. My vest is a NetBridge Electroluminescent safety vest (contact at [email protected]). I haven’t had any problems but I have heard from another person with the same vest that some of the LED lights did not hold up very well. Nathansports.com also makes a LED vest ($30) and Trek has a strap with LED’s that can be strapped to your arm, leg or wherever ($8). REI sells both LED and non-LED vests. Warmth: Unfortunately I had the opportunity to experience several commutes with temperatures below 5°F this winter. I have issues with my hands getting cold when the thermometer drops below 15. In the past, I have used mitten style gloves with a liner that work well, though one loses a little dexterity with mittens. I had seen advertisements for BarMitts and received a set for my birthday in 2010 (www.Barmitts.com). For a similar product try: (http://www.trails-edge.com/retail/te_shirts/amfbikemits.htm ). BarMitts are a Neoprene sleeve that attach to your handlebars. You then slide your gloved hand into the BarMitt to operate the brakes and shifters for either flat or drop style handlebars. I found that the BarMitts helped by about 10° of additional warmth to a glove I commonly use, perhaps more as the temperature dropped. The BarMitts are slightly restrictive so reaching for the brake may be a small fraction of a second longer a well as shifting, but certainly not dangerously so. I could not fit my bulky mittens in the BarMitts, but I found my gloves that normally work down to around 25° kept me very warm in the BarMitts. I use a handlebar-mounted mirror on my commuter bike so I had to cut a small hole on the one BarMitt so I could slide the mirror through the Mitt. Above 15-20° (and up to 30) I use either a bulky full finger ski glove or my new Giro gloves with the 2-finger “lobster” style (these replaced my 15 year-old duct taped lobster gloves). If you use a handlebar-mounted mirror as I do, you will run into a small complication mounting a BarMitt. I cut a small hole on the one BarMitt so I could slide the mirror through the mitt. BarMitts (BarMitts.com) and MooseMitts (by Trails Edge) are $60-65. Ice and Snow: There are good reasons to be concerned when the roads are snow-packed or are ice covered. Fortunately the roads are well salted in Salt Lake County, so there are few days when conditions are, in my opinion, nasty. Without going into details why, let’s just say I acquired a Surly Pugsley. This bike has 4-inch tires that roll over anything. It seems to be well designed for snow packed roads or trails. It is a confidence builder in a snowstorm. I did use this bike in less than optimal conditions on 6 or more occasions this year. Visions of a Chevy commercial where the SUV plows through a snow bank can be applied to this bike. Given that, I have some reservations about the Pugsley. In my opinion, it’s best utility is in towns that are flat and are snow packed for more of the winter than we experience here in Salt Lake City. The bottom bracket is wide to accommodate the wide tires so you will note that your foot placement on the pedals is a little wide, sort of like wearing snowshoes for the first time though you will get used to this rather quickly. You will also feel like your sitting a bit high on the bike perhaps a combination of high bottom bracket and large tires. For those that know me, I can go uphill rather well due to my being 130 lbs (though being 60 years old is becoming a negative factor). The Pugsley definitely challenged me on steeper roads or the slopes of a certain golf course (of course I will deny riding on a snow covered golf course if that is illegal). Using the term “sprinting across traffic lanes” becomes an oxymoron on the Pugsley so give your self a little extra time. Perhaps the Pugsley would “sprint” better, but I keep the tire pressure at about 18 lbs, for riding across ice and snow. Finally, despite having multiple eyelets for racks and fenders, good luck trying to find such accessories that work around 4 inch tires. I made my own rear fender using thin metal flashing and modified a wide front fender with duct tape to give adequate coverage for the wide tires. I had a pair of extra long rack stays in an old parts box that enabled me to attach my Axiom rack. When you have 4-inch tires, weight is considerable, so it seems that the tread thickness of the “Endomorph” tires are thin to keep the weight down. As a result, I did pick up the last remaining thorn on Feb. 1st of this year. Using my CO2 cartridges (2) I inflated the tire and rode to a meeting after work. After the meeting, on what was the coldest night of the year for me (5° with very windy conditions) I decided to go to plan C for the 2nd time in over 28 years of marriage. “C” is for Call (wife). Changing a tube in a Pugsley for the first time was shall I say different and challenging compared to my normal commuter bike. It turned out that the road was not as ice and snow covered as I anticipated on that day, so I would not have picked up the thorn had the conditions been worse. As I mentioned earlier, the Pugsley is best on snow packed roads. I think next year I will try out a set of studded tires. Service: I now have a Park chain checker, tool # CC-3. This is a solid metal piece that you set in your chain. It is really simple to use. It has 2 markings, 0.75 and 1.0. If the 0.75 slides easily into the chain, it is time to replace it. If the 1.0 slides easily into the chain, you may be facing not only a new chain but also a new cassette. In addition, excessive chain wear could also result in needing new chain rings on the crankarms. Chains should last 3000 miles, but due adverse weather conditions perhaps less. For the year-round commuter consider this for the toolbox. Lights: I’ve used NiteRider lights for 20 years. I like the lights but I’ve had some issues. This year I had a cracked cable wire. Given that I use lights for about 100 nights a year (or more) I put my lights through a lot of use. I do have smaller backup light, but it is not adequate for daily commuting by my standards. So I would also like to thank Mike Hanseen at Millcreek Bicycles for lending me his NiteRider light set for several weeks while mine was being serviced. (Repair service is not rapid). This is an example of how your purchases and support at your local bike shop pays off more than the savings of web based or catalog bike stores. One Response to "Gear For Your Winter Bike Commute"